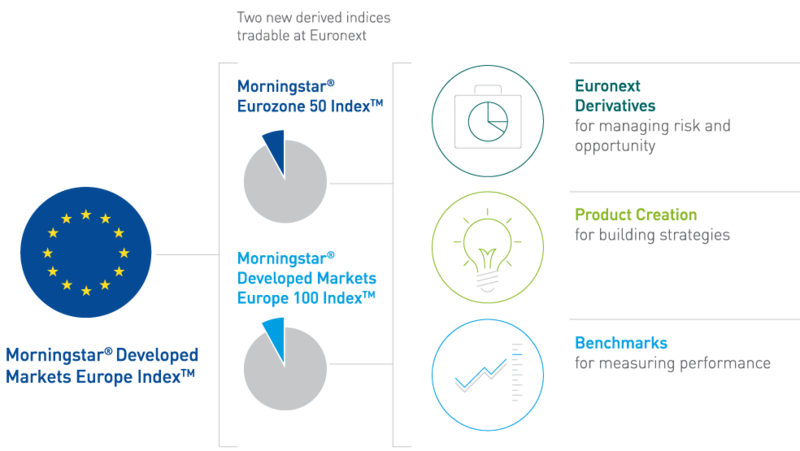 Euronext and Morningstar are working together in the launch of Morningstar European Indices and associated Derivatives instruments, traded on Euronext. The offer is designed to provide product creation opportunities and risk management tools that can help investors access consistent exposure to European markets and manage risk in their portfolios. Euronext, the leading pan-European exchange offering transparent equity and derivatives markets, and Morningstar, the leading global provider of independent investment research and data provide access to a disruptive business model and a competitive alternative to Europe’s existing Indices offering. The indices are built for asset managers, insurance companies, consultants, wealth platforms, advisor networks, discount brokerages, retirement plans providers, sponsors, ETF issuers, banks and trading desks. Free equity beta indices when used for benchmarking. Free constituent holdings on a monthly basis. A competitive licensing fee for investment product creation. Aggressively limited fixed fee levels to license the indices to create bank structured products. The indices are part of Morningstar Indexes and included in Morningstar’s Open Indexes Project, which delivers Morningstar’s global equity indices for no cost to the investment community for benchmarking purposes. Meeting industry demand for disruptive business model solutions via low cost licenses, the Open Indexes Project gives free access to 95 global equity indices.